Just spoke with Janet on the phone, wonderful customer service skills, excellent knowledge of the product lines! I appreciate her wit and manner on the phone and her explanation of product limitations! Marvelous! 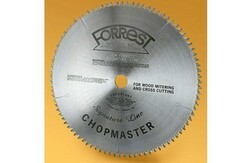 Check out the FORREST SIGNATURE LINE! Forrest has designed the BEST Precision Trim Blade ever for sliding compound miter/chop saws. Manufactured with more teeth and hi-tech, proprietary tooth design for a quieter cut with even better splinter control. The alternate shear face design is superior for precise cutting of delicate pre-finished crown moulding, picture frame moulding and composite moulding. Made with double-hard C-4 Submicron Carbide for up to 300% longer life. A heavier than normal steel plate maintains maximum stability for the best cut. A negative face hook also adds to optimum rigidity when cutting. ATBR teeth diagram.